New book “That's Muhammad Ali's Brother! My Life on the Undercard”, from Page Publishing authors Rahaman Ali and H. Ron Brashear, with the foreword written by Gene Kilroy, the longtime business manager of Muhammad Ali, is the groundbreaking first-hand story of life as it was in Louisville, KY, and around the globe, through the eyes of the brother of the Greatest of All Time, Muhammad Ali. Rahaman Ali, who lives a quiet life with his wife Caroline, and H. Ron Brashear, a boxing writer/columnist and IT Director, have finished their book “That's Muhammad Ali's Brother! My Life on the Undercard”: a gripping and potent behind-the-scenes recollection of what it was like growing up alongside possibly the most famous person to ever live. Published by New York City-based Page Publishing, Rahaman Ali and H. Ron Brashear’s well-crafted tale is a gripping and potent memoir filled with a plethora of emotion and a tone of honesty that is unforgettable. The memories the author shares in this book are the ones he will treasure forever. Living through these experiences helped shape his life and made him the man he is today. The author states that he can say for a fact that no other man took as many punches from the champ as he did as a result of the training and sparring sessions that they had over the years. 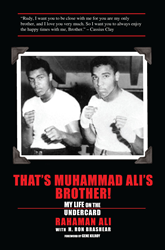 Readers who wish to experience this gripping work can purchase“That's Muhammad Ali's Brother! My Life on the Undercard” at bookstores everywhere, or online at the Apple iTunes store, Amazon, Google Play or Barnes and Noble with a portion of the proceeds to directly benefit the Muhammad Ali Center in Louisville, Kentucky.